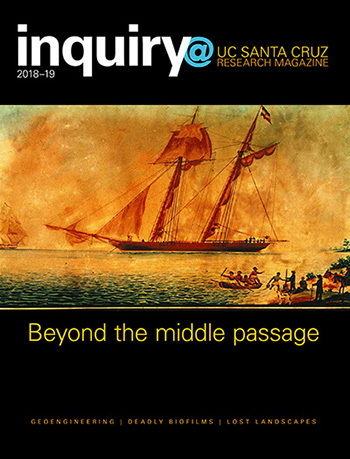 The 2018-19 issue of Inquiry@UC Santa Cruz, the annual research magazine from the UC Santa Cruz Office of Research, is now available online at inquiry.ucsc.edu, offering readers a wide range of stories about research spanning the campus's five divisions: Arts, Humanities, Physical & Biological Sciences, Social Sciences, and Engineering. The intra-American slave trade, cholera bacteria, variation in the human genome, the geoengineering governance dilemma, and archives of ephemeral films and home movies are among the subjects of feature articles in this issue. The cover story focuses on work by Greg O'Malley, associate professor of history, to document the trafficking of slaves after they were brought to the Americas from Africa. A new "inquiries and innovations" section in this issue highlights the campus's intellectual property and industry partnerships. This is the fourth edition of the campus research magazine, written and edited by graduates of the UC Santa Cruz Science Communication Program. David Egerter (SciCom '88) edited the magazine, which is produced by UC Santa Cruz Communications and Marketing.